Purple agate gemstone wire-wrapped by hand. 2.25" long, 0.75" wide. This one-of-a-kind pendant is hand-crafted by a local Austin, TX artisan. Amethyst and blue tourmaline gemstones wire-wrapped by hand. 1.75" long, 0.5" wide. This one-of-a-kind pendant is hand-crafted by a local Austin, TX artisan. 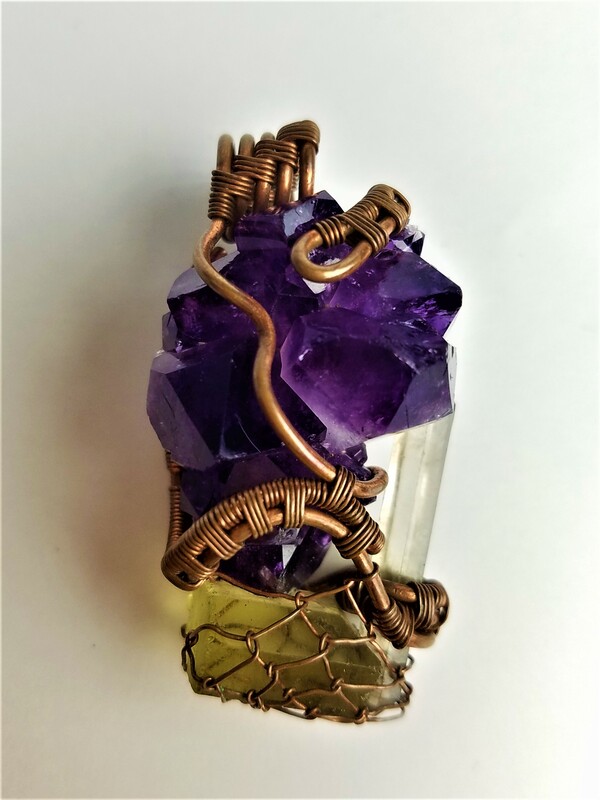 Green apatite, purple quartz, and amethyst gemstones wire-wrapped by hand. 2" long, 1" wide. This one-of-a-kind pendant is hand-crafted by a local Austin, TX artisan. Dumortierite gemstone wire-wrapped by hand. 2" long, 1.25" wide. This one-of-a-kind pendant is hand-crafted by a local Austin, TX artist. Green apatite and yellow tourmaline gemstones wire-wrapped by hand. 2.25" long, 1.25" wide. This one-of-a-kind pendant is hand-crafted by a local Austin, TX artisan. Amethyst, green apatite, and clear quartz gemstones wire-wrapped by hand. 2" long, 1" wide. This one-of-a-kind pendant is hand-crafted by a local Austin, TX artisan. Triangular opal gemstone wire-wrapped by hand. 2.5" long, 1.5" wide. This one-of-a-kind pendant is hand-crafted by a local Austin, TX artisan. Green quartz gemstone wire-wrapped by hand. 2.75" long, 1.5" wide. This one-of-a-kind pendant is hand-crafted by a local Austin, TX artisan. Green quartz gemstone wire-wrapped by hand. 2.25" long, 1.5" wide. This one-of-a-kind pendant is hand-crafted by a local Austin, TX artisan.